STEP 1. 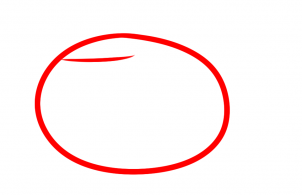 Make an oval or oblong shape like so and one facial guideline. STEP 2. 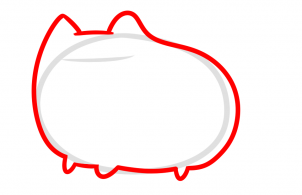 Once that is done draw out the body concept which has ears, legs and a back end. STEP 3. 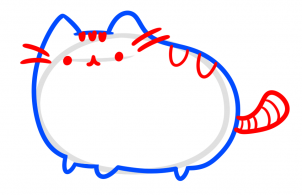 We will now draw the whiskers, eyeballs and mouth. Add the tail and stripes on the tail, head and back. Erase the guides and you're done. STEP 4. That's it. Your line art should look like this when you are all done. 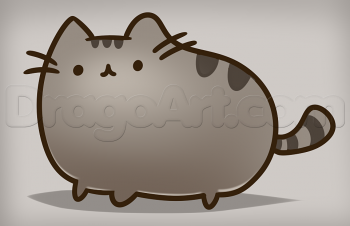 Have fun coloring Pusheen the Cat in.